Sometimes we find that no matter how hard we work at something, we are not capable of achieving our goals. Our own experience and efforts are insufficient to the task. We realize that we need others. Other perspectives, other experiences, other energy to get it done. In these circumstances, we find that we need to collaborate. We need to bring our best, unique contributions together in a way that releases great synergies. My colleagues and I have found in our field research in dozens of countries that this deep collaboration is best supported by three kinds of listening, each done twice in a continuous process, a process that we have come to call the O Process. These three kinds are intentional listening, relational listening, and imaginal listening. While there are many technical expressions of each of these forms of listening, here I will describe them briefly, what they do, and what they look like in practice. Intentional listening. Listening for intent, for the deeper shared purpose, for the motivating will force common to the group that brings everyone together to achieve one bigger goal that requires all of us to participate. Here we listen for the “why” we are coming together. It is most useful when made explicit, and when everyone gets clear on what it is and whether it is important to them. When this deeper shared purpose is clarified, amongst all in the group, you have a very strong motivating force that also provides a container, a set of guidelines, for what is to be worked on as a group. As the group moves into working together, they now have a clear standard to check whether the group’s exploration serves this purpose or serves another purpose. Relational listening. Listening for connection, for why each other individual in the group both (1) connects to the deeper shared purpose, and (2) what their unique contribution is to that purpose–why they care and why they are needed. Since you already listened for the deeper shared purpose, you are now listening for why you want to be deeply curious about and interested in what this person has to contribute to your ability to achieve the deeper shared purpose, after all their perspective is critical, which is why they are part of the group. Imaginal listening. Listening for what possibilities the other people see from their unique perspectives. Since their contribution is unique to the group, it is different from yours. They are seeing something different, which begins to highlight different dimensions of the challenge the group is working on. Through your listening, you can begin to see an image of what they are seeing, you can begin to imagine it. As we come to the top of the O Process, we have used three different kinds of listening, with clarity now on why the group has come together, why each person is needed and what they contribute, and now what they see. We can now begin to materialize–to tangibilize–what we see together. We can now use the same three kinds of listening again, to now tangibilize, to make tangible, the possibilities we saw together. Imaginal listening, part 2. At one moment in the creative process of seeing possibilities together, we reach a point where we begin to see the same reality, and the possibilities converge into a probability. At this moment, we bring our imaginal listening to seeing what each unique perspective sees of the emerging probability. This emerging probability, which begins to feel real, has many different dimensions to it, which the different perspectives we have can help us see. What image can you begin to perceive, as you build up the different dimensions each person sees? Relational listening, part 2. With a clearer image of what we are collectively looking at, from multiple perspectives, we can now begin to make this ours, to bring it into what we can each commit to. Since what we are now imagining is in service of the deeper shared purpose we started with, which part of what we are seeing is mine to take up? What part is yours to take up? This is where we again use relational listening, to listen for how we each relate to the emerging image, each from our own unique contribution. Intentional listening, part 2. Now that we know how each of us is relating to what we saw together, we now move towards what we are going to each do, how we are going to each engage our own will, our own intentional force, to begin to do something to move this image into a reality. Here we use the intentional listening to hear what each of us is going to do, the actions that we need to take up, aligned with our new commitment to our unique contribution to the image we are realizing. What energy will I give to moving closer to the image we saw in service of the deeper shared purpose? What will you give? In this process, we see why we are coming together to collaborate, what perspectives are needed, what they can see, what we can see together, what that begins to look like as we manifest it, what we can each commit to in realizing that image, and what we can each do. A great step forward in collaboration, supported by three kinds of listening, each used twice. How Do You Organize for Collaborative Action? How does one organize for collaborative action? It seems that only a small percentage of lots of attempts at collaboration are being successful. Sometimes people naturally segregate, with each one basically doing his or her own thing, singing their own song. Sometimes people flock, flowing as individuals somewhat together, singing the same song. And, sometimes people become a whole that brings out their individual best, creating a harmonic through a specific synthesis of their unique voices. Three very different ways in which people interact: (1) segregating; (2) flocking; (3) uniting. Does the difference matter? As people we tend to organize our interactions to increase our ability to achieve greater impact, resilience, and creativity with a more engaging experience. People seem to find these characteristics critical to being able to work together, and to being able to achieve movement on large-scale social issues. What drives this difference in how people come together? Whether they segregate, flock, or unite? Current theories suggest this is driven by an endowment effect, leadership, or luck. The endowment effect suggests that the difference is because of something special the people have—they are smarter, wealthier, better educated, more experienced. The leadership effect suggests that an individual or group was able to envision and engage people in a specific form of interaction. The luck effect suggests it just happened somehow. Each of these three is hard to replicate. Is there another, simpler explanation of why people tend to segregate, flock, or unite? Maybe complexity theory can show us something. Complexity theory looks for the simplest explanation: what is the simplest set of rules that guide the behavior of an individual can explain the observed social behavior when many individuals interact? Can a high variety of behaviors be better explained by (1) complexity in the way 3-4 simple principles intermingle or by (2) the complicated number of ways in which a wide breadth of number of variables with a depth of details interact? Complexity theory has shown that bird flocking can be explained by 3 principles: keep in the same general direction of the others; keep some separation from the others; and do not run into anything. Ant trails can be explained by 4 principles: take a couple of small steps and turn; smell for pheromones; follow pheromone trail to food (where pheromones get weaker); drop pheromones on way home (where pheromones get stronger). Can we explain the 3 observed behaviors with specific kinds of responses to these four questions? Segregating. Assume scarcity of resources—there is not enough—with one primary relationship deciding and enforcing (like the boss for the whole group), focusing on the outcomes to be achieved with the scarce resources in a way that satisfies the primary relationship (in this case, the boss). Designed to separate, interactions are transactional, to improve one’s own health and growth. Get people to do the jobs required to achieve the outcomes through their own specific tasks. Each replaceable person is made to focus on doing only their own part. These tend to be the principles when you find dozens to hundreds of small groups each working on their own part of what seems to be a higher principle, like how to reform education or health care. Flocking. While assuming sufficiency of resources – there can be enough for me and for you – primarily for your own self or your own group, pay attention to your relationship with others, moving generally in the same direction, toward a similar outcome, focusing on how being aware of others can help move you towards the desired outcomes. Designed to flock, interactions are relational, working on one’s own together. Everyone focuses on doing their part, as it relates to others. Uniting. Assume abundance of resources – in relationship to the potential and dynamics of systems of resources, there is enough for all – with vibrant relationships for self, other, group, nature, and spirit. Designed to collaborate, focus on the interaction of the unique contributions each person makes to their own development and to the whole, as it tangibilizes the available potential. What outcomes are we seeing? With segregation-based principles, paying attention only to one’s own outcomes, individual efforts are able to achieve moderate levels of impact, usually with low resilience to the ever-changing environment. Seeming success comes in spite of the huge costs of scarcity of not paying attention to others, creativity, and potential. Many people are well aware of this experience, and experiment with flocking-based principles, where they share information with others, and attempt to work generally in the same direction. We find through cooperative coordination these efforts are able to achieve more significant impacts with a bit more resilience, as long as each of the involved groups is also successful. We are also finding groups working with uniting-based principles, who are able to continuously bring out the best in each other, constantly exploring each other’s individual and collective potential, resilient in shifting with the ever-changing environment, often generating those changes. We are trying these principles ourselves. Most of our work at Vibrancy focuses on taking on collaborative efforts based on uniting principles, whether large-scale social change, such as regional food systems, complementary currencies, toxic-free economies, retrofitting regions, or small-scale, community-based efforts, such as schools, companies, government agencies, or local communities. We are learning about how to apply these principles in a wide variety of settings. We synthesize what we are finding about co-hosting collaboration in the O Process, where highest impact resilience starts with the “we” available in a shared deeper purpose, then clarifies what specific voices are needed to make unique contributions to achieve the deeper purpose. We can then understand together where to dedicate our individual and collective efforts to achieve the outcomes we desire collectively and individually within the resilient dynamics of the system of our interactions. It turns out to be much easier than most of us think, once we shift the principles guiding our interactions. From separating principles, we can only move alone, never together. That would be impossible, blue-sky thinking. From flocking principles, we can only move with others, never united. That would be impossible, soft and fuzzy process. From uniting, we can achieve our own health and growth, in relationship with others who are also contributing with us to what we want. People show up, in support of each other, to achieve together what they cannot achieve alone. This happens every day, everywhere. Sometimes, to take on really audacious issues, we need other people. In many cases like this, someone often says, “They won’t come talk with us.” Agreeing, someone else says, “Even if they do show up, they will not agree with us.” Someone else then chimes in, “Even if they agree with us, there is no way they will be able to do anything about it with us.” The invitation is dead on arrival. I hear some version of this at the beginning of almost all “multi-stakeholder” processes. And, so far, in over two decades of attempts, it has never been true. People will show up, agree, and act together. It depends on the invitation. I see the invitation as an issue of differentiating and integrating the “we”–what we share and why we work together. Here is a recent example from my work in health. What we share–a passion and deep commitment to healthy community. Why we work together here now–to address the disparities in health outcomes in vulnerable communities. Technically, we can differentiate between a higher-order, overall purpose (the ends) and an immediate, local purpose (the means). The higher-order purpose, our deeper shared purpose, provides the context for what we see, the field of our Yes! I find that when we get clear on the deeper purpose that we share, what we really care about, then the invitation gains a life of its own. I often hear from folks coming together, often for the first time, “I didn’t know, after all these years, that you cared about this too.” It seems that we tend to observe the intermediate goals of others and assume their deeper purpose, which it turns out we usually get wrong. The immediate, local purpose provides the specific within the general–the specific game within the rules of the game. This is the problem we are coming together to address, within a bigger opportunity envelope, the game we are going to play in the sandbox. When we can agree on the sandbox, and we can agree on how the immediate, local purpose connects to the higher-order purpose of the sandbox, we can begin to play together. This distinction between what we share, described with the higher-order purpose, and what we come together to do, described with the immediate, local purpose helps us delineate the general from the specific, any game we might play together from this game we are agreeing to play right now. What does this look like in practice? In our work in Guatemala, everyone wanted a healthy, safe Guatemala. We worked together on understanding the dynamics of generating self-determination for every Guatemalan. In Vermont, everyone wanted sovereignty for Vermonters in deciding their own energy future. We worked together on how to realize a 90%-renewable-energy portfolio across electricity, heating, transportation, and efficiency in the next generation. For Food Solutions New England, everyone wanted an equitable, healthy food system. We worked together on how to get half of the food consumed in New England being produced in New England, a 5x shift. In the World Green Building Council, everyone wanted to redefine access to healthy buildings. We worked on the dynamics of experiencing regenerative buildings for everyone everywhere every day. In our organization Vibrancy, we want a world where everyone has more vibrant experiences every day, achieving better results every day. We are working together to figure out how to leverage everyone’s capacity to do that, starting with our own research and services. There are many processes available for exploring these two “we” questions. One that frames how I work with the question of “what we share” acknowledges a hierarchy of values in a conversation. We each have means to the ends we want to achieve. We each have values that guide these means and ends. Many of these values, means, and ends overlap with those of other people. Approaches to values hierarchies structure these overlaps, showing what is common in what we want, either along the way to an ends or the ends itself. For framing the question of “why we work together,” I often work with the behavior over time graph to determine what problem behavior we want to understand and shift. In mapping out this behavior over time, we begin to see the dynamics that generate that behavior, leading us to insights into the dynamics needed to shift that behavior. I use these insights to see how the interactions of whose perspectives influence both the current and desired behaviors, and how shifts in the interactions of these perspectives might lead to the desired behaviors. This lets me know who needs to be in the exploration and how I can invite them to work on a problem together, which is why we work together. I find that people will show up, in support of each other, to achieve together what they cannot achieve alone. It can happen every day, everywhere. It is an agreement. The invitation to an agreement is a choice. Something piqued my curiosity about the most viewed posts of my blogging on ecosynomics and vibrancy since mid-2009. Of 282 posts, the two most viewed looked (1) at the big questions every culture has seemed to explore for thousands of years, and (2) at the process we observe when people are able to align in a deeply collaborative way. As both posts seem very appropriate to much of the work the global Vibrancy community is co-hosting with groups around the world today, I thought I would repost the links to them today. Some people have shared with me that they have favorite posts that they like to share with others. Do you have a favorite one? I would love to know. Enlightened Brainstorming or Collaborative Inquiry? Creativity continues to reign. In The Icarus Deception, Seth Godin reminds us that all humans are creative and the task is to unleash that creativity. The exploration for processes that unleash the most creativity continues, with every observer suggesting something different, including yours truly. One of the mainstays in this ever-expanding exploration is called “brainstorming.” As most widely applied today, the accepted technique is attributed to Alex Osborn, who describes the technique he developed, in the 1930’s, in his book Applied Imagination. While adopted widely, the merits of brainstorming are still widely debated. In Creative Conspiracy, Professor Leigh Thompson of the Kellogg School of Management suggests an upgrading of the brainstorming technique to deal with the many criticisms of its basic form. Brainstorming 1.0 uses Osborn’s original four rules: (1) all individuals should freely express any idea, (2) with no criticism from anyone on the ideas, (3) focusing on the quantity of ideas to their quality, while (4) building on each other’s ideas. Thompson suggested Brainstorming 6.0 adds four new rules: (1) stay focused on the task at hand, (2) without diving into details or explaining through stories, (3) encouraging everyone to contribute, and (4) reminding everyone of the problem being addressed when idea-generation slows down. She cites lots of research to demonstrate that these enhancements greatly increase the flow of creativity. What do the Ecosynomics framework and experience of harmonic vibrancy have to say about Brainstorming 1.0 and 6.0? Let’s look at what happens when you stick to just the rules Osborn and Thompson suggest. With Brainstorming 1.0, it is about the generation of lots of ideas, by whoever is in the room. In the O Process, which I described in a previous post, this means starting the process in the thinking realm. Everyone shares what they see as possible. Clearly this is more generative than not asking people to share what they see or shutting people down when they start to share. People are creative, as Seth Godin reminded us, and sharing is more generative than not sharing. Brainstorming 6.0 addresses the critiques of 1.0 that people will get off topic or begin to dominate the airwaves, taking up most of the bandwidth. So, what is being shared is irrelevant to the problem at hand or some people are not sharing. Version 6.0 strengthens version 1.0 by adding the feeling-relating realm of the O Process. Everyone is now included in the process. These upgrades generate more creativity. The full O Process (see figure below) highlights the remaining criticisms of version 6.0. Is the initial problem statement the right one? If the real problem is something else, then any brainstorming is irrelevant and inefficient. Are the people in the room the right ones? Do they provide the necessary breadth and depth of understanding of different dimensions of the problem? More important than the number of people in the room is the requisite diversity of people in the room. When building on each other’s ideas, the depth of knowledge each brings is important, and the breadth of relevant perspectives is important. Does each individual see how his and her experience relates to the agreed-upon problem? If she does not see how her experience and expertise relates to the stated problem, then her ideas are less relevant. Does each person agree on the importance of the problem? If she does not see that she cares about the problem and how her experience relates to its solution, she is much less motivated to see deeply into new possibilities — it becomes a simple mind exercise versus something she wants deeply to see resolved. 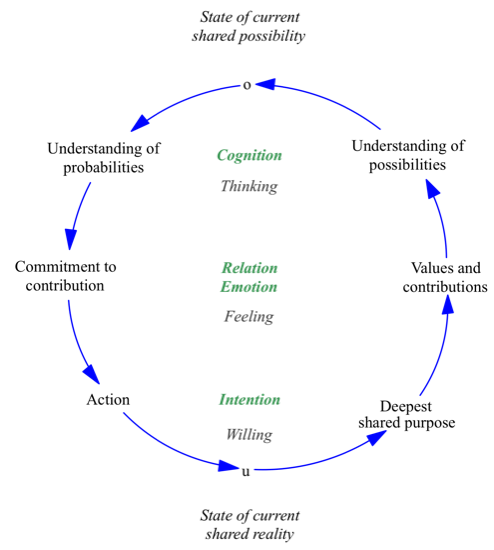 As the O Process suggests, people engage much more deeply when they are clear that they share a common higher purpose, to which each individual brings a critical, unique contribution everyone needs to be able to generate and see the best possibilities from which to choose a future course of action that everyone can commit to and enact. Said more abstractly, engaging the willing-intention provides the shared container and the relatedness in which each individual is invited to contribute the best possibilities they can see in their own minds from their unique experience and expertise. When these possibilities are seen together, the probabilities that emerge are much easier to relate to and enact, for each individual. Over the years, colleagues have taught me much about good processes for building collaboration. I have distilled these processes into an overarching process with six elements, which I draw out in the figure below. After enough people began to call it the “O Process,” the name stuck. The O Process supports two forms of alignment that I have found critical to deep collaboration. The first alignment is within six areas, and the second alignment is across them. I find that most high performing groups have strength in both alignments, that most mediocre and weak groups have little of either, and that people working independent of each other have none of either. The alignment is around the shared higher purpose, the unique contribution of each stakeholder, the specific possibilities each perspective can see, the common seeing of a future reality – a shared probability, the commitment each stakeholder can make to realizing the shared future reality, and alignment around the actions that can achieve collaboration on those commitments. When aligned these six areas bring great strength and sustainability to any endeavor. I first seek to find and make transparent the alignment that exists in the higher purpose that everyone involved finds important. Whether it is the health of children in a school community, a specific consumer focus in a sock company, or a patriotic sense among citizens of a country, something brings the stakeholders of a specific interest together. When there is alignment around this higher purpose, a common goal can be seen, made transparent, and used to make explicit what is common among groups that seem to be at odds with each other. Sharing this deeper purpose provides the conditions for guided autonomy, as suggested by jazz pianist Frank Barrett, using limited structures and constraints to maximize opportunities for diversity. This allows everyone the freedom to contribute their creative best. Each person makes a unique contribution to the shared purpose. Most people only value their own contribution, believing that others are wrong-headed, a waste of resource, or secondary in importance at best. Alignment around seeing each other’s unique contribution validates the other’s existence, builds appreciation, and strengthens the trust that came out of seeing a shared higher purpose. Each stakeholder brings a unique perspective on what is possible. Given the specific pathway and specialization of each stakeholder, no two see the same possibilities. Alignment around seen possibilities highlights how these are different perspectives on the same future reality that the different unique contributions can see. When there is alignment on these first three areas – shared purpose, values and contributions, shared possibilities – something incredible happens, shared probability, the fourth alignment. When this happens, everyone involved sees the same future, and that future begins to become “real.” This happens when people begin to dedicate resources to something, way before it shows up physically. In the creative process, this coalescing into one shared picture is called an “aha” moment, an insight. Many processes support the putting together of possibilities into forms that make the probabilities easier to see. As the new reality seen with others begins to sink in, it comes into the relational space where people begin to make commitments to the contribution they can make to this shared future reality in alignment with the higher purpose they share. Having made relational commitments about specific contributions each individual can make to the probability seen, it is time for action. To act in alignment requires alignment around the will to go back to one’s own world and do something. When the culture “back home” supports these actions, because they fit with what is already being done there, taking on actions and completing them is relatively each. In many cases, though, the new collaborative probabilities seen require commitments to action that are not consistent with the existing culture back home. For people to take these actions, then, they require support from the group. Alignment within each of these six elements provides for a more collaborative process, which is even stronger when there is alignment across the six elements. For example, this means that alignment around the shared higher purpose sets the context for the alignment around the values and contributions of each participant. When all six elements are aligned internally and across all six, a completely new level of collaboration emerges. Some people I have worked with say, “We do that,” meaning that they work through the O process. Yet, when I explore what they actually do, I find that they often start at the cognition level of possibility and wonder why nobody shows up at the relational level of commitments or the intention level of action. They often miss that they need alignment on the right-hand side, in deepest collective purpose, and values and contributions to convert the possibilities into probabilities that people will commit to and take action. When I have seen the full O process engaged, it releases extraordinary power. It seems that people shy away from alignment on all six elements, because they think it will take longer. It will not surprise you now to see that, in fact, this alignment actually accelerates the process, leading to much greater efficiency, effectiveness, and innovation. Why? Greater efficiency results from people actually relating to the probabilities they co-created towards something they think is important, thus little energy is wasted in trying to push and coerce people into doing things they do not want to do – the reality of most projects. Greater effectiveness comes about when people align on the purpose they share and on what each other uniquely contributes to that shared higher goal. Innovation shows up because everyone present saw and contributed their unique perspective, providing a richer environment of possibility in which the probability emerged. Greater efficiency, effectiveness, and innovativeness from a bit more alignment – a great investment. This framework evolved out of my many years of working with Scott Spann (Spann, 2007; Spann & Ritchie-Dunham, 2008). The broad category of process and content tools for aligning around shared purpose describe the hidden purpose and shared values that are already present. For a broad overview and integration of specific processes for forming and working with shared objectives and values, see (Hammond, 1996; Keeney, 1992). Recent case studies highlight the benefits of shared purpose, as reflected in the “extraordinary economic and social value” they found in their study of 33 higher-ambition CEOs (Foote, Eisenstat, & Fredberg, 2011). Tools that align the values and contribution of others focus on: (1) the ability to see and appreciate another human being; and (2) the designer’s ability to see how different parts fit together. The broad fields are inquiry and systemic design. For more on emotional and social intelligence, see (Goleman, 1995). For more on appreciative approaches to inquiry, see (Cooperrider & Whitney, 2005; Torbert, 1994). For more on systemic approaches to design, start with the classic treatise that influenced many schools of design (Alexander, 1964). To see that each individual has his own values and plays a functional role, the distinction of part versus whole is useful, best described in systems language as a functional part and a whole (Ackoff, 1993) and in integral language as a holon (Koestler, 1967; Wilber, 2000b). The broader category of tools that align possibilities focus on collaborative idea formation. De Bono provides two classics on appreciating different perspectives (De Bono, 1971, 1999). The conversion of possibilities to probabilities deals with different forms of sensemaking – How can I know what I think until I hear what I say? – characterized by the social psychologist Karl Weick (Weick, 1995). Most good processes have some form of commitment making, following some form of the RACI (responsible, accountable, consulted, informed), or the “atom of work” by Flores, which provides processes for making and keeping commitments (“Using the Methods of Fernando Flores, an Interview of Jack Reilly,” 1997). Also see (Connolly & Rianoshek, 2002).